LUCY BURDETTE: As soon as the crisp days of fall arrived, I developed a craving for pimento cheddar scones. We all know that cravings are best indulged–lightly that is! I decided that these would be a perfect addition to a Thanksgiving menu, but they’d also go well with turkey soup for an easy supper after the holiday. They freeze well, too–what are you waiting for? Preheat the oven to 425. Mix together the dry ingredients, then cut in the butter using a pastry cutter or your food processor until it resembles coarse meal. Blend or pulse in the cheese. Stir together the egg and milk and add this to the other ingredients. Mix until combined. Pulse the pimentos lightly into the dough, just enough to spread them around. Dump the dough onto a floured surface and knead for a minute until everything holds together. 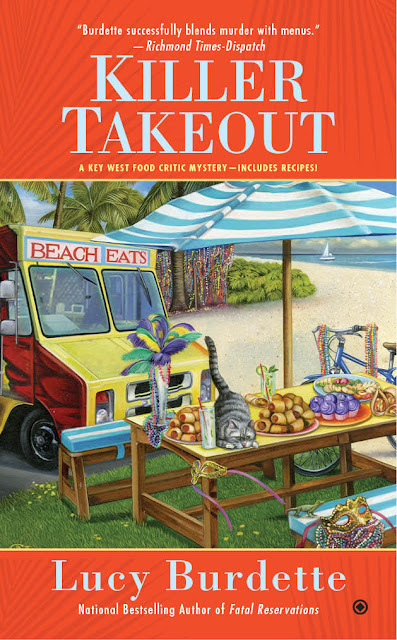 Death on the Menu, the 8th Key West food critic mystery, is available now from Crooked Lane Books. You can order it wherever books are sold! LUCY BURDETTE: In the eighth Key West mystery, Hayley and her mother Janet are catering a Key West/Havana conference at the Truman Little White House. This is the dessert they serve for the final dinner. And it is the perfect recipe to celebrate the arrival of DEATH ON THE MENU! The basis of this recipe came from a cookbook called Cuba! – Recipes and Stories from the Cuban Kitchen. I love lime cake and yellow cake and whipped cream, so you can imagine that this recipe was irresistible. I know Mojitos require rum, and yet I am not a big fan of alcohol-flavored desserts. So I chose to leave the rum extract out of the cake, and instead add a teaspoon of rum. This gives it a little soupçon of flavor without overwhelming the cake. I also reduced the salt in the batter and the rum in the frosting. You can adjust the rum upward to a tablespoon if you choose. Prepare two 9 inch cake pans by buttering them and lining with parchment paper. Butter the paper too. Preheat the oven to 350. Mix the dry ingredients for the cake together and set this aside. In your KitchenAid, food processor, or with an electric beater, beat the butter well with the sugar until light and fluffy. Beat in the eggs one at a time. Mix in the vanilla extract, the lime zest, and the rum. 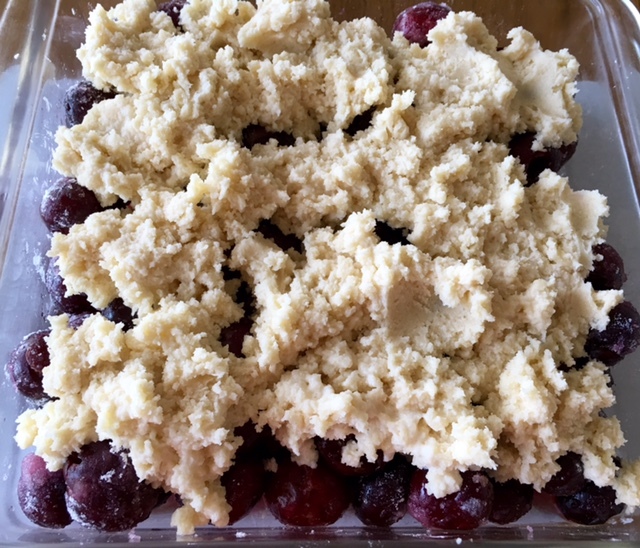 Fold in the dry ingredients, don’t overmix. Stir in the milk. Divide the batter into the two prepared pans and bake about 30 minutes until the cakes spring back when touched. Cool for 10 minutes in the pan, and then remove them from the pans and cool completely. For the lime mint syrup, heat the sugar and water in a small pan until the sugar is dissolved. Turn off the heat and stir in the mint leaves. Let them steep for 10 minutes, then strain them out and stir in the lime juice. Paint this glaze onto each layer of cake with a pastry brush. Whip the cream and sugar until stiff, and stir in the rum. Drop half of the whipped cream onto the first layer. Place the second layer on top and spread the remainder of the cream over that. Decorate with thin slices of lime or mint leaves as desired. Death on the Menu, the 8th Key West food critic mystery, hit bookstores on August 7 from Crooked Lane Books. You can buy it in hardcover, e-book or audio book, wherever books are sold. 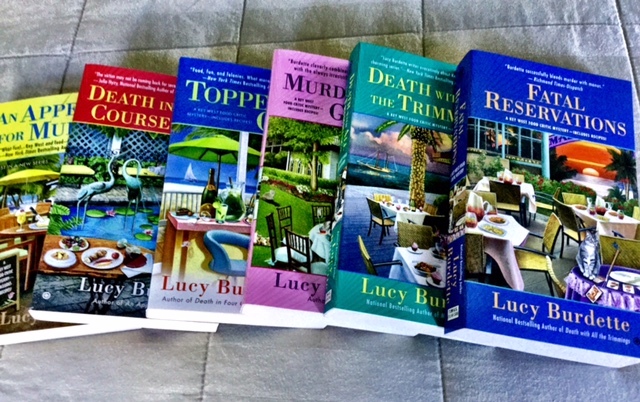 LUCY BURDETTE: I wanted to make a cake for a small dinner party, but I didn’t have a lot of time. (Big deadline looming for food critic mystery number nine.) I Googled “easy yellow cake” and came across the recipe on which this cake is based. It was simple, because everything gets added into the food processor in turn– No sifting, no separating of eggs, no alternating liquids with dry. And it was very good, light but dense. Maybe not my favorite yellow cake for all time, but very good! Preheat the oven to 350. Prepare two 9-inch cake pans by buttering well and then flouring lightly. Combine the butter and sugar in the food processor and beat until pale yellow. Beat in the eggs. Add the flour, salt, and baking powder and mixed that minimally. Beat in the milk and vanilla, again don’t overbeat. Bake in a preheated oven at 350 for about 25 minutes, until the cake springs back when touched lightly. Then cool for 10 to 15 minutes and then remove from the pans to cool completely. Frost as desired– My desire was whipped cream and sliced strawberries, but chocolate or mocha butter cream would be wonderful as well. Here’s a pre-order the book link from Amazon–and here’s a link to preorder a hard copy from RJ Julia in CT, where you’ll be able to get a signed copy. Or you can order it from Books and Books in Key West, or call Suzanne Orchard at Key West Island Bookstore ((305) 294-2904)–she’ll be delighted to order you a copy! One day I noticed that two of the other travelers in our group – both originally from England – were sipping tall white drinks at both lunch and dinner. They explained that this was a yogurt drink called a lassi, good for calming stomachs that might be a little bit distressed by traveling and unfamiliar flavors. So I tried one and was instantly hooked. Apparently there are salty lassies as well as sweet, which can contain fruit, especially mango. I only tried the plain one as we were being very cautious about eating fruit too. But I determined I would make one and share it when I got home. So here is the simple recipe for a mango lassi. Peel and pit the mango and whirl it in your blender or food processor until puréed. Then add the yogurt and whirl that in too. If it’s too thick to drink, add a couple of ice cubes and grind them up with the yogurt/mango mixture. Or you can just add the ice cubes to the glass. Sprinkle with a little cardamom and enjoy! Are you a fan of Indian food? Or an adventurous eater? 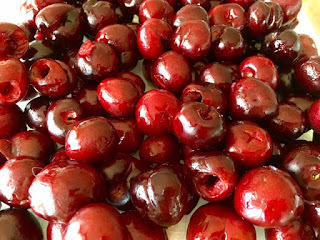 LUCY BURDETTE: I know I’ve mentioned my supper club on this blog here in the past–we are six couples who try to get together 3 to 5 times a year for dinner and chatter. The hostess (and host) are responsible for the main course and the table setting, and each of the other couples brings a dish. 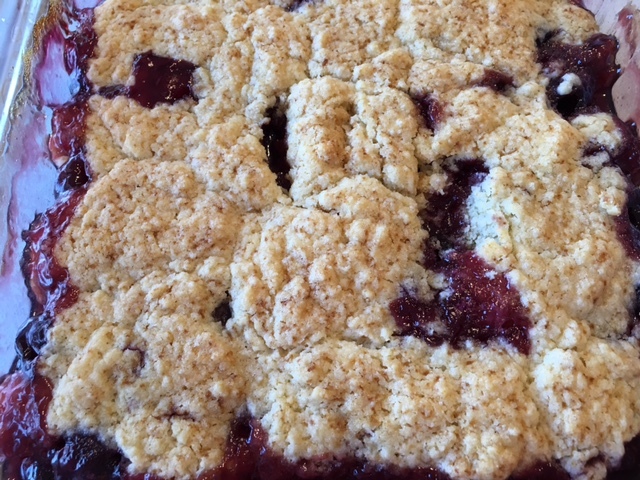 The hostess can assign certain recipes or leave it open-ended. For various reasons, this year got away from us so we wanted to throw together an easy summer supper. We ended up with a mixed grill, potato salad, salad, grilled vegetables, and a lemon and orange-glazed angel food cake from 4 and 20 Blackbirds bakery in Guilford CT for dessert. Everyone loved our shrimp and the peaches so I’ll share those recipes with you! 1 to 2 large cloves of garlic, chopped Mix the ingredients, olive oil to brown sugar, and taste to see if you need more lemon. Stir in the chopped garlic. Let the shrimp sit in the marinade in a glass dish for 2 to 4 hours, stirring from time to time. Meanwhile, soak bamboo skewers in water. I had the 8 inch kind, which fits three large shrimp. Thread three shrimp crossways onto each skewer so they will lie flat on the grill. Grill on medium high heat for three minutes each side. The brown sugar should result in a nice glaze. For the peaches: Pit six peaches and slice them lengthwise. (We all agreed there was no need to peel them!) Brush the peach flesh with lemon juice and then a bit of olive oil. Sprinkle with fresh rosemary. Grill for 6-8 minutes in a grill pan, flipping once. I served the shrimp with grilled sausages and grilled peach halves–A very very mixed grill! 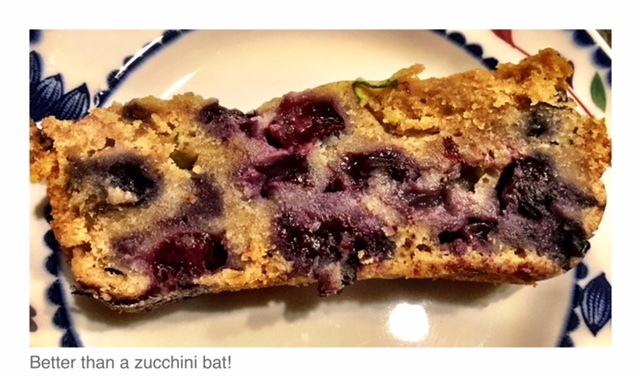 But in case this happens to you, here’s a yummy recipe for zucchini/blueberry bread. Preheat oven to 350 degrees F. Oil two 8×4 inch loaf pans. 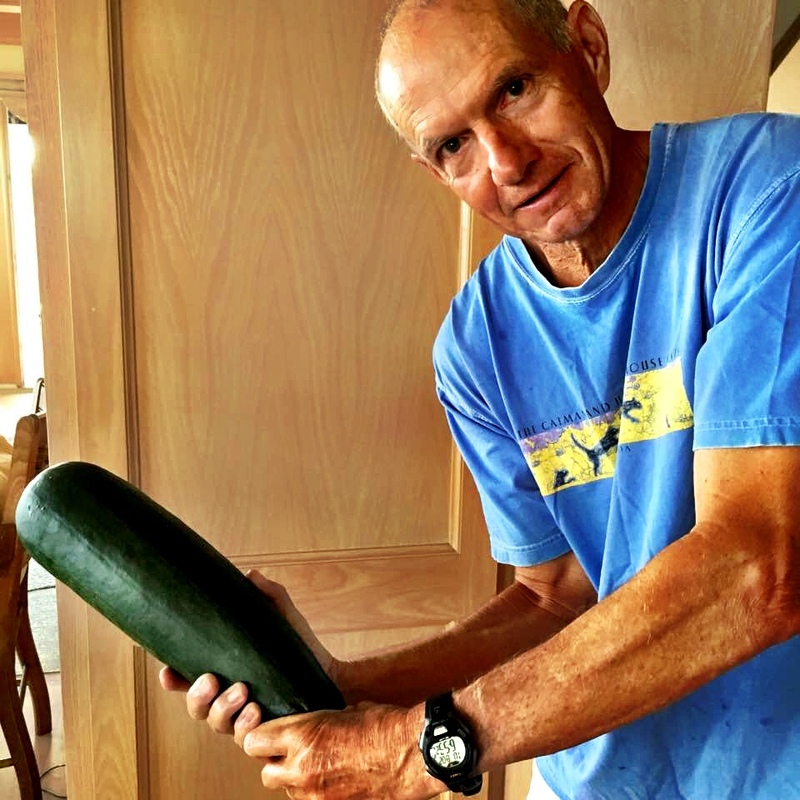 In a large bowl, whisk together the eggs, applesauce, vanilla, sugar and zucchini. In a food processor, whisk together the flour, sugar, cinnamon, baking powder, and baking soda. Cut in the butter. 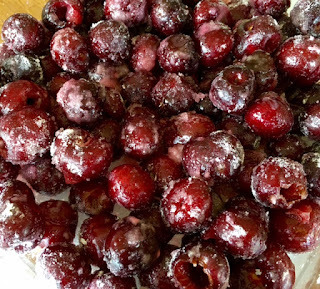 Mix a tablespoon of the flour mixture into the blueberries. Add the dry ingredients to the wet ingredients and stir gently. Carefully stir in the floured blueberries. Divide the batter between the two prepared pans. Bake for 55 to 60 minutes, or until a toothpick inserted into the center comes out clean. Cool for at least 20 minutes, then turn out bread onto wire racks until it has cooled completely. It’s perfect for celebrations, like the publication of a new book! Or simply reading a great book. LUCY BURDETTE: This year for Christmas my wonderful uncle sent me a big box of dried Michigan cherries. They are so sweet and delicious! 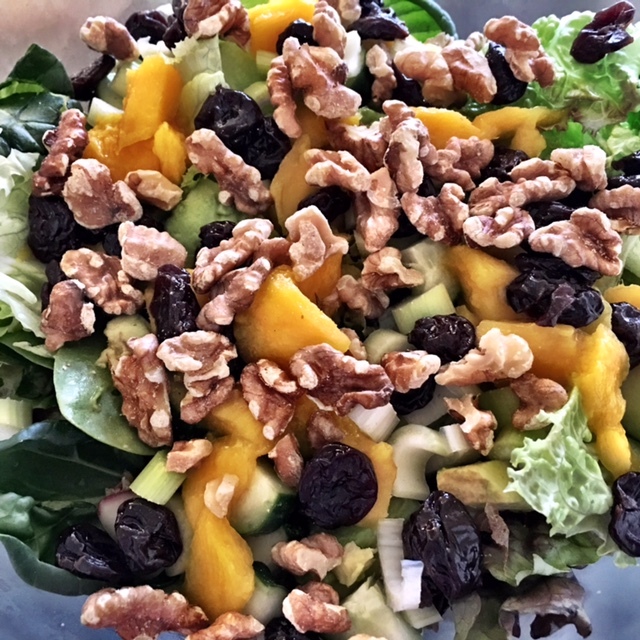 I’ve used them in granola and cookies, but I wanted to find a salad to showcase them as well. This combination does just that. Dress with a mustard vinaigrette and toss, once your guests have admired the presentation:). (You of course should feel free to make your own tweaks, onions if you like them, or some kind of soft cheese, for example.) 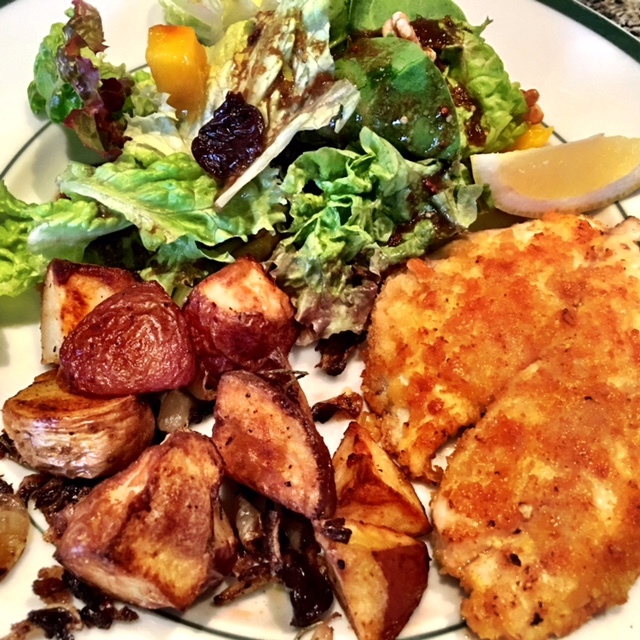 In this case, we ate the salad with pan-fried yellowtail snapper and roasted rosemary potatoes–yum! LUCY BURDETTE: In Key West in the winter, we get lots of houseguests (no surprise!) Suppose you’re looking for something special to serve your visitors for breakfast? Over a year ago, I made some blue cornmeal pancakes that were to die for (she said modestly.) But when I went back to look at the recipe, I was shocked about how much sodium was involved. In pancakes! Who knew? So this is a revised version, equally delicious, probably under 100 mg of sodium for the whole batch. Next time we’d double the amount and freeze any extras for quick lunches or snacks. Stir together cornmeal, all-purpose flour, baking powder, baking soda, and sugar in a large mixing bowl. In a separate bowl, whisk together buttermilk, egg, vanilla, and 2 tablespoons melted butter. Add the blueberries. Mix the wet ingredients into the dry and stir until mostly combined. Heat the pan or griddle and melt some butter to cover the bottom. Add the wet batter to the pan. Cook over medium heat until bubbles pop, then flip the pancakes over and cook the other side, 1 to 2 minutes. Serve with real maple syrup. Next time I would also top with a dollop of plain yogurt. 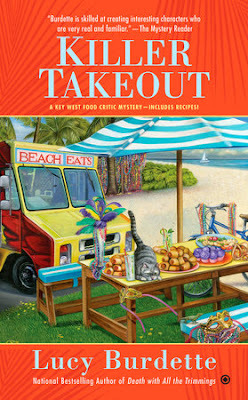 KILLER TAKEOUT is coming next April, but available for pre-order today!